LONDON – London diners, like their New York City counterparts, are in thrall to fat. Especially fat of the pig variety. The trend has been reigning supreme for years now, and though vegetarians are gaining ground from the left flank, the noble hog isn't ceding his throne anytime soon. Much ado was made of when it opened near touristy Trafalgar Square in 2010, and much is being made of its new sister restaurant, , on the East End. Technically, they both call themselves wine bars, but don't be fooled. The wines on offer may be excellent, but you're here to eat. If not actual pig then, frankly, like one. Everything about Brawn is genteel, friendly, cozy, and fun. The white-washed walls of the front room are lined with giant windows overlooking Columbia Road, a street that's sleepy except on weekends, when it explodes. The back room has a view of the open kitchen. The bar is decorated with a birdcage and fake parakeet; cookbooks share space with wine bottles on the shelves. The young mix with the old, the hipsters with the stodgy. Enough about the scene. What about the food? For lunch, a girlfriend and I ordered from every section of the menu: nduja (from "Taste Tickler"), lardo di Colonnata (from "Pig"), Cornish cod Dieppoise and fried artichokes with aioli (from "Plancha"), bitter leaf salad (from "Raw & Cured"), leek gratin (from "Slow Cook"), and salted butter caramel crêpes (from "Pudding & Cheese"). Cod, at £15, was the most expensive item on the menu. Yes, we ate everything. You might argue that you can't judge an English restaurant until you've had its Sunday roast, and I wouldn't argue with you. 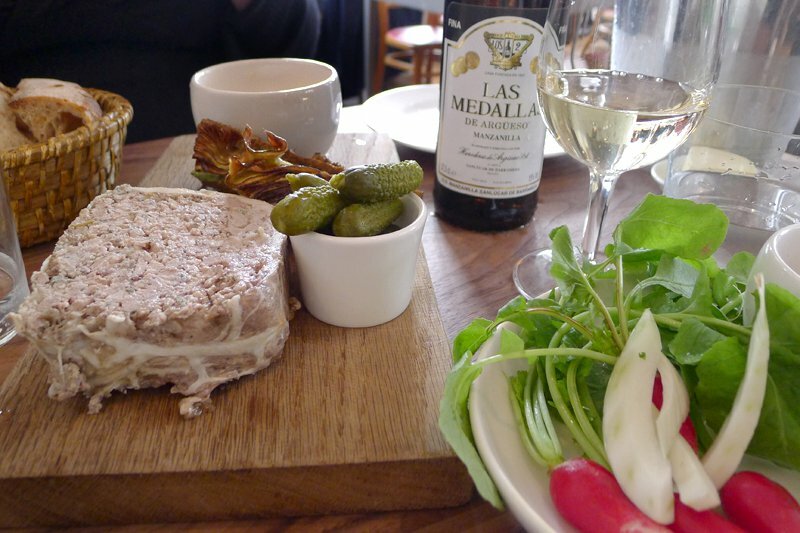 When I went back a few weeks later with another girlfriend, the £25 per head menu started with anchoïade and breakfast radishes, middle white pork terrine, and fried artichokes with aioli. The main course was Suffolk pork belly with cauliflower cheese and mashed potato. We skipped rhubarb Eton mess and had a selection of cheeses instead. The two of us ate enough for seven, and kept going. And then we rolled on home. Узнайте про популярный web-сайт с информацией про Купить куртку из Китая.